Croscosmia are perennial blooming bulbs in the iris family and grow from underground corms. Producing multiple blooms in the summer on long-arching stems, crocosmia flowers in the warm hues of yellow, orange, bright red and deep crimson. In addition to being a good specimen or mass bedding plant, crocosmia are excellent for use in long live cut flower arrangements. Plant crocosmia corms in a locale with a full sun to partial daily shade exposure. Use your trowel to prepare a well tilled soil bed and nestle the bulbs into the soil two inches deep with the flatish root plate facing down. Cover over with soil and water in well. In USDA zones 5 through 11, crocosmia can overwinter in the ground soil. In colder climate zones dig the corms and store in sand or peat in a cool but frost free protected area until planting out again in the spring. Water the corms infrequently after planting until green shoots begin to appear. After that, begin a watering regimen to keep the soil surrounding the corms evenly moist throughout the growing season. Sprinkle a general purpose balanced crystal or granular fertilizer, around the base of the plants in spring and again later in summer. Feed according to the manufacturer's suggestion and water it in well. Harvest fresh flowers for arrangements by cutting at the base of the stem with clean sharp secateurs. Deadhead prune fading flowers or allow them to dry on the stem as decorative seed pods. 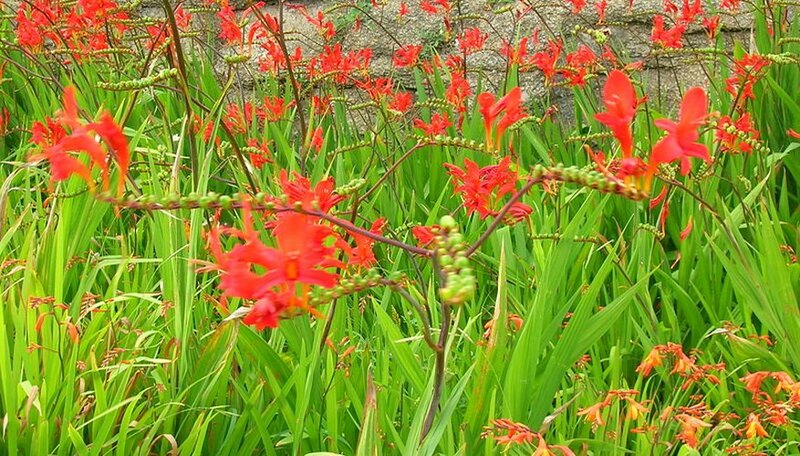 In colder climates where crocosmia does not overwinter, cut back above ground foliage after the first hard frost or leave in place over winter and cut it off in very early spring making way for new foliage growth. Mulch over the corms in winter with an organic material such as shredded bark, compost or leaf mold to protect the corms and prevent moisture loss. Though not overly attractive to insects and garden pests, if spider mites flare up on your crocosmia, apply a spray of insecticidal soap or horticultural oil to knock out the infestation.